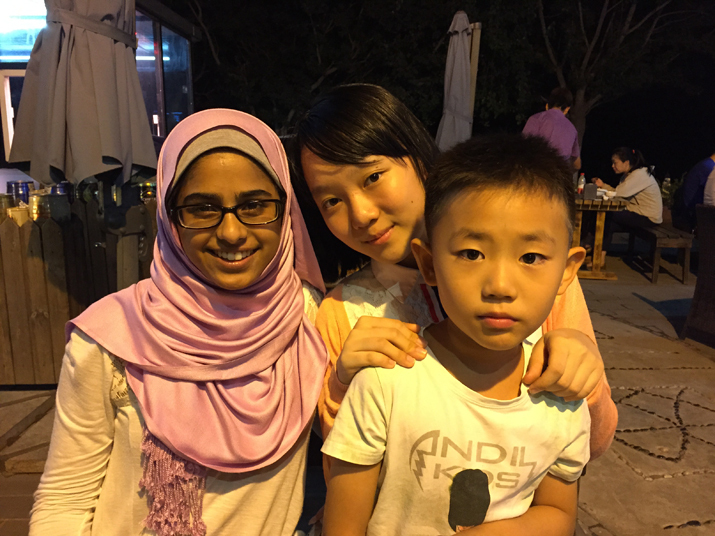 Yumna Naqvi never imagined she would one day study in China, let alone live with a host family. But life is full of surprises. The 16-year-old high school student from New Jersey is currently studying at the Second High School Attached to Beijing Normal University and enjoying her life in the capital city. Naqvi is part of School Year Abroad (SYA), a U.S.-based study abroad program that places American students in a foreign school for one academic year. She discovered the program while attending a conference hosted by the 100,000 Strong Foundation in Washington, D.C. in 2014. The foundation, which was founded in 2013, encourages American students to study in China and connects them with universities, high schools and other organizations that offer study abroad programs. Naqvi became interested in the Chinese language and culture about four years ago when she chose to study Chinese to satisfy her school's language requirement. "Mandarin is honestly such a fascinating language. It's so different from all the other languages," Naqvi told Beijing Review . But she said her Mandarin is still not very good, which is why she wanted to come to China. She hopes to become more fluent in the language during her time here. However, her parents initially rejected the idea of her traveling alone to a distant country at such a young age. They were also concerned about some of her personal restrictions because she is Muslim. It took some convincing, but her parents finally acquiesced. "They realized going to China would be a great opportunity for me to learn the language and the culture and be a better global citizen," Naqvi said. The application process is intense and difficult, especially for students like Naqvi who applied for a full scholarship that covers tuition and books. The first hurdle was to submit five essays. Next, she had to attend an interview with SYA alumni. She was also required to present letters of recommendation from her teachers. Naqvi started the application process in December last year and was admitted with a full scholarship this February. Although Naqvi has been in Beijing for only about a month, she said she is already accustomed to life here and her classes are not that different from the ones she had back home. With the exception of her Mandarin lessons, which are taught by a native Chinese teacher, all of her classes are taught by Americans from the SYA program. The hustle and bustle of the metropolis is vastly different from her hometown where life is more relaxed. In Beijing, she has to get up early to catch the bus to go to school, while at home her mother usually drove her so she could take her time. Before coming to China, she spent a lot of time researching the culture online so she would be prepared for the differences. Also, several Chinese friends warned her about cultural differences and what she should do to be polite. In addition, the SYA handbook outlined several social practices she should be aware of and how to act in certain situations. "I adjusted pretty quickly because I read a lot about the culture so it wasn't very new to me," said Naqvi. Her host family, from the Hui ethnic group, is also Muslim. She and her 13-year-old host sister are able to learn English and Chinese from each other. The family plans to take her on trips to other regions in China, including Shanxi Province in the north and southwest China's Yunnan Province and Tibet Autonomous Region. Cultural differences between Naqvi and her host family sometimes cause interesting discussions. "I don't eat as much as my Chinese host family wants me to, so they think I don't like the food," Naqvi said. "I always have to say I like their food very much even though I cannot eat that much." 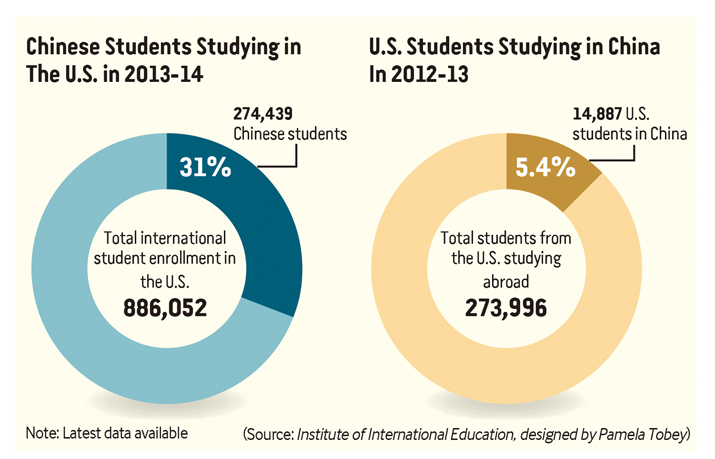 Over the past three decades, swathes of Chinese students have pursued higher education in the United States. About 274,000 Chinese students studied at universities in the United States during the 2013-14 school year, according to a report from the New York-based Institute of International Education. However, just 15,000 American students studied in China during the 2012-13 school year, according to the latest figures available. During a 2009 visit to Shanghai, U.S. President Barack Obama proposed an initiative to send 100,000 American students to study in China over a four-year period from 2010 to 2014. The initiative was officially launched by then Secretary of State Hillary Clinton in 2010 and run by the Department of State for several years. In 2013, the 100,000 Strong Foundation was established, and spun off from the department as an independent organization. The foundation is working to make China a popular destination for American students who want to study abroad. Today, it has about 250 student ambassadors who have studied in China to promote the concept to their peers. Naqvi is one of them. "It's very important to have the next generation of American students be China-savvy and be equipped with the skills that will allow them to constructively engage with counterparts in China," Travis Tanner, Senior Vice President of the 100,000 Strong Foundation, told Beijing Review . Last summer, the organization reached its goal of sending 100,000 American students to study in China, Tanner said. Through her role as a student ambassador, Naqvi has completed two projects and is in the middle of a third to encourage more of her peers to study in China. Because she is the only student from her high school to study abroad in China, she gave a presentation on the 100,000 Strong Foundation and the SYA program to her fellow Mandarin language classmates during the 2015 Chinese New Year. She then wrote an editorial in her school's newspaper about the benefits of studying abroad. "It's great educating people on the opportunities they have," Naqvi said. Her latest project is a personal blog documenting her time in China and presenting her viewpoint of the country. "U.S. students are very candid and open and they show more acute curiosity in thinking and learning about different cultures as well as being endowed with greater esprit de corps (team spirit). They are willing to participate in discussions and raise tough questions. They are also more willing to accommodate cultural differences because the United States is an ethnically and culturally diverse country," said Shi Anbin, Associate Dean of the School of Journalism and Communication at Tsinghua University in Beijing. Over 3,440 international students from 126 countries studied at Tsinghua during the fall of 2014 with 77 percent obtaining a degree and 23 percent visiting on exchange. The United States is the second most represented country of origin for international students at the university, lagging only South Korea. Tanner believes that people-to-people relationships are the foundation for the China-U.S. relationship. "Those personal ties and connections between the people of both nations are critical to ensuring we have built more mutual trust between each other, and it's a great way to resolve some of the issues that may exist in our relationship," he said. Tanner has a long history with China. He first came to the country in 1998 and planned to stay for one year. That plan was quickly derailed after he began to learn Chinese and about the culture. "It's so different from my own culture and language. It's so interesting to study on my own," said Tanner. He ended up staying and working in China for three years and continues to be a student of the Chinese language and culture. "It's something that completely shaped my life," said Tanner. Naqvi echoed Tanner's sentiments, saying, "If America sends more students to China to learn, to be more globally aware, the world will be a better place. If you are aware of other people's cultures, you will be more accepting of them." "You have so many Chinese students that are going to America, but you don't see many American students going to China," she added. "It needs to be reciprocated." • Failure to Make a Difference?